Gritty, the new mascot of the Philadelphia Flyers, gets a bobblehead. The Flyers have been a pretty middling team for a few years. The roster says one thing but the standings and playoff exits have said another. When a professional sports team gets in a rut of decency, the energy and confidence just need a little jump. That is why we now have a crazy mascot. He may seem insignificant and childish compared to hockey, but his name and his excitement are symbols the Flyers can feed off of when the season starts next month. Gritty's arrival in Philadelphia and on the national stage was a sensation. He was called names, called superfluous, derided and mocked in front of the world. That went on for maybe two days and then everyone decided f*** it, he's actually pretty cool (never doubt the Mascot Guru). 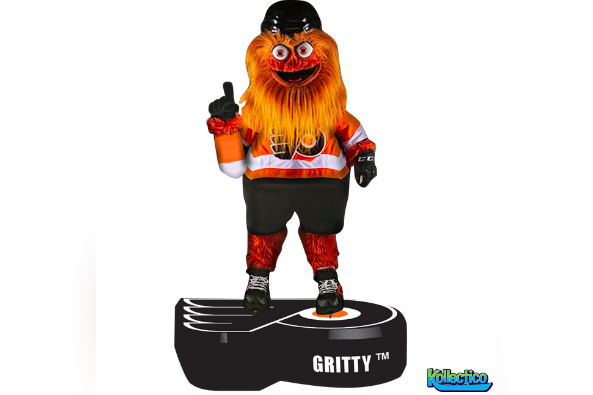 Well, Flyers fans, in what must be record time for a mascot, there's now an officially licensed Gritty bobblehead. It's available for pre-order at the website of the National Bobblehead Hall of Fame and Museum. Crafted by Kollectico, the Gritty bobblehead will put you out $30, which you have to figure is way more than Gritty has ever had in his wallet. Until now, that is. When the inevitable next remake of "A Star is Born" comes around, we all know who deserves the lead role.